The Omni Diet was written by Tana Amen after she successfully cured her chronic health issues by eating the right foods. While battling digestive problems, constant infections, and even thyroid cancer, Tana discovered that healthy eating was the answer. As she researched how different foods interact with the body, she discovered that a diet, primarily plant based, held the cure for her ailments and thus, The Omni Diet was born. Amen says that weight loss is just a side effect of The Omni Diet. Tana Amen describes The Omni Diet as 70% plant and 30% protein. The plan is dairy free and only includes foods that are organic, hormone free, and non-inflammatory. The primary goal of the diet is to increase nutrition and reduce inflammation. The basis of the Omni Diet is a 6 week eating plan that transitions dieters into eating according to the 70/30 ratio. Dieters are taught about foods that traditionally we have been told are “healthy” and why they are not. Amen also discusses the vital importance of incorporating nutrient dense foods, which she calls Omni NutriPower Foods. Eliminates dairy products except for free range, organic eggs. Soy based products are eliminated. Refined sugars and carbs are eliminated as well as fruit juice. Foods should be as minimally processed as possible. Only high quality animal protein sources are permitted. Amen encourages dieters to stick to the plan for at least 14 days as it takes at least two weeks for tastebuds to adjust and to detox from all the bad foods they have been eating. Drink a green smoothie at least twice a week. Exercise 1 extra day each week, preferably using weight training. Find someone to be accountable to. Go to a sauna twice a week to detox. Practice gratitude: List 5 things you are grateful for each day. Tana Amen recommends the use of dietary supplements as part of the Omni Diet. She makes general recommendations like using fish oil, but also devotes a part of the book to promoting her husband, Dr. Daniel Amen’s, line of supplements. Veggie Scramble with kale, red bell pepper, garlic, pepper, and onion. Exercise is an important component of the Omni Diet. Exercise contributes to strong bones and releases powerful endorphins. An easy to follow exercise plan is included. 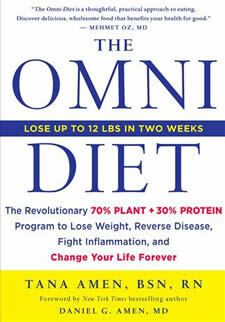 The Omni Diet: The Revolutionary 70% PLANT + 30% PROTEIN Program to Lose Weight, Reverse Disease, Fight Inflammation, and Change Your Life Forever retails for $27.99. Focuses on highly nutritious foods. Reduces the amounts of pesticides, toxins, and hormones eaten. A holistic approach to weight loss. The Omni Diet includes recipes. Recommends changes to be incorporated gradually. Author is an RN and fitness expert. Organic and free range foods are more expensive. Some will struggle giving up sugar and dairy. Promotes Dr. Amen’s line of supplements which seems like a conflict of interest. The Omni Diet seems like a great diet for those wanting to focus on eating more plants but not be completely vegetarian. The increased nutrition and anti-inflammatory effect of this diet should help people be healthier and disease free. Weight loss will likely occur due to less calories consumed with the elimination of refined sugars and refined carbs although dieters will still have to exercise portion control when eating the complex carbs recommended in The Omni Diet.